The Azure Relay service enables you to securely expose services that run in your corporate network to the public cloud. You can do so without opening a port on your firewall, or making intrusive changes to your corporate network infrastructure. The relay service supports the following scenarios between on-premises services and applications running in the cloud or in another on-premises environment. Bi-directional and unbuffered socket communication across network boundaries. Azure Relay differs from network-level integration technologies such as VPN. An Azure relay can be scoped to a single application endpoint on a single machine. The VPN technology is far more intrusive, as it relies on altering the network environment. An on-premises service connects to the relay service through an outbound port. It creates a bi-directional socket for communication tied to a particular address. The client can then communicate with the on-premises service by sending traffic to the relay service targeting that address. The relay service then relays data to the on-premises service through the bi-directional socket dedicated to the client. The client doesn't need a direct connection to the on-premises service. It doesn't need to know the location of the service. And, the on-premises service doesn't need any inbound ports open on the firewall. Hybrid Connections - Uses the open standard web sockets enabling multi-platform scenarios. WCF Relays - Uses Windows Communication Foundation (WCF) to enable remote procedure calls. WCF Relay is the legacy relay offering that many customers already use with their WCF programming models. The Hybrid Connections feature in Azure Relay is a secure, and open-protocol evolution of the Relay features that existed earlier. You can use it on any platform and in any language. Hybrid Connections feature in Azure Relay is based on HTTP and WebSockets protocols. It allows you to send requests and receive responses over web sockets or HTTP(S). This feature is compatible with WebSocket API in common web browsers. For details on the Hybrid Connection protocol, see Hybrid Connections protocol guide. You can use Hybrid Connections with any web sockets library for any runtime/language. Hybrid Connections of Azure Relay replaces the old Hybrid Connections feature of BizTalk Services. The Hybrid Connections feature in BizTalk Services was built on the Azure Service Bus WCF Relay. The Hybrid Connections capability in Azure Relay complements the pre-existing WCF Relay feature. These two service capabilities (WCF Relay and Hybrid Connections) exist side-by-side in the Azure Relay service. They share a common gateway, but are otherwise different implementations. WCF Relay works with the full .NET Framework and for WCF. You create a connection between your on-premises service and the relay service using a suite of WCF "relay" bindings. The relay bindings map to new transport binding elements designed to create WCF channel components that integrate with Service Bus in the cloud. For more information, see getting started with WCF Relay. Listening client sends a listening request to the Azure Relay service. The Azure load balancer routes the request to one of the gateway nodes. 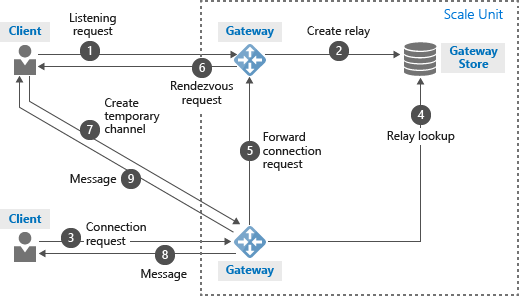 The Azure Relay service creates a relay in the gateway store. Sending client sends a request to connect to the listening service. The gateway that receives the request looks up for the relay in the gateway store. The gateway forwards the connection request to the right gateway mentioned in the gateway store. The gateway sends a request to the listening client for it to create a temporary channel to the gateway node that's closest to the sending client. The listening client creates a temporary channel to the gateway that's closest to the sending client. Now that the connection is established between clients via a gateway, the clients can exchange messages with each other. The gateway forwards any messages from the listening client to the sending client. The gateway forwards any messages from the sending client to the listening client.